My boyfriend is kind of hard to shop for. He says he doesn't want anything and if he needs something he just gets it. He likes painted or carved wooden boxes, so I decided to check the charity shop - they've moved to a bigger building and I hadn't yet checked it out. Well, no luck finding something for him...but I found myself some goodies! I love old craft books. How could I resist a sewing book with "the 70s greatest looks" on the cover? I've flipped through it and it's full of tips and information. The Crafts and Hobbies book is crazy. It includes not only macrame, spinning, and tie-dye, but sculpture, bread baking, preserving fruit, and wine making. The knitting books seem to be for beginners but have some nice basic patterns. The needlepoint one is just pretty. Maybe I'll start doing that again someday. They had so many patterns. I looked through all of them. There were A Lot of great 70s ones but for a person smaller around than I. Maybe I'll go get a few for inspiration, though, or to put in frames as decoration. 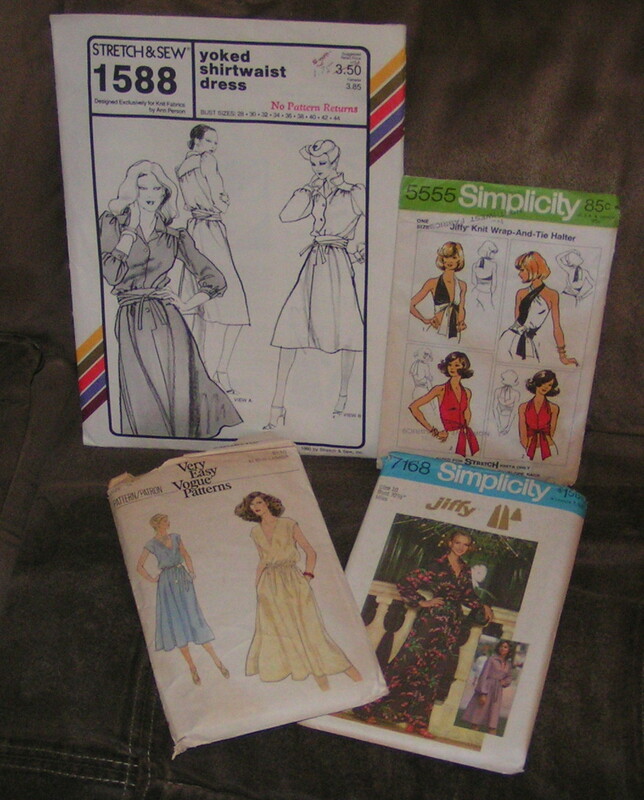 I was surprised to find sewing patterns. When I volunteered there the general thought was to toss them. The new bosses obviously don't feel the same way. Thank goodness! Fabric! The pink is a thin fleece and there's five yards. I don't have any ideas right now but something will eventually come to me. The black is four yards of a light cotton and the blue is seven yards (!) of a similar light cotton. 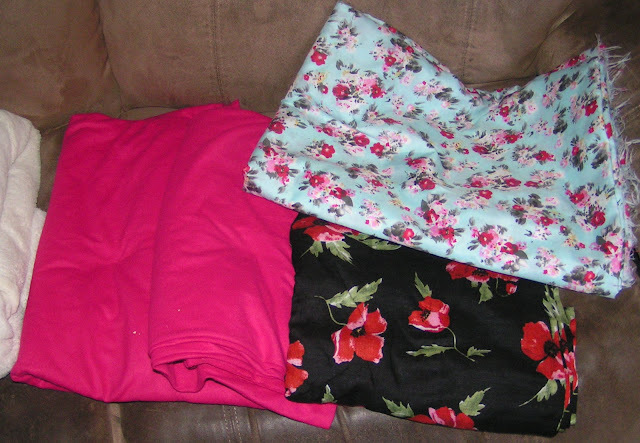 The cashier was impressed that I like to make clothes and we talked a bit about how sad it is to think of the working conditions in clothing factories. I really need to get in there more often. They have it planned out nicely and it was easy to move around and look at everything. When I picked Kerry up yesterday I noticed three second-hand stores near his dad's house. (Kerry is staying with his dad. I'm heartbroken but he's doing great in school and that's what really matters.) I've noticed a small fabric store and a couple of "junk" stores, too. It seems like I should plan to spend a day checking it all out. Who knows what kind of goodies lie waiting for me? Hello my.lovely!!! Thank you for your Christmas wishes!!! Your finds look great. I love the shiny girl with the hat!!!! Hope that your Christmas was delightful!!! Those books look fantastic. Congrats on all your finds! 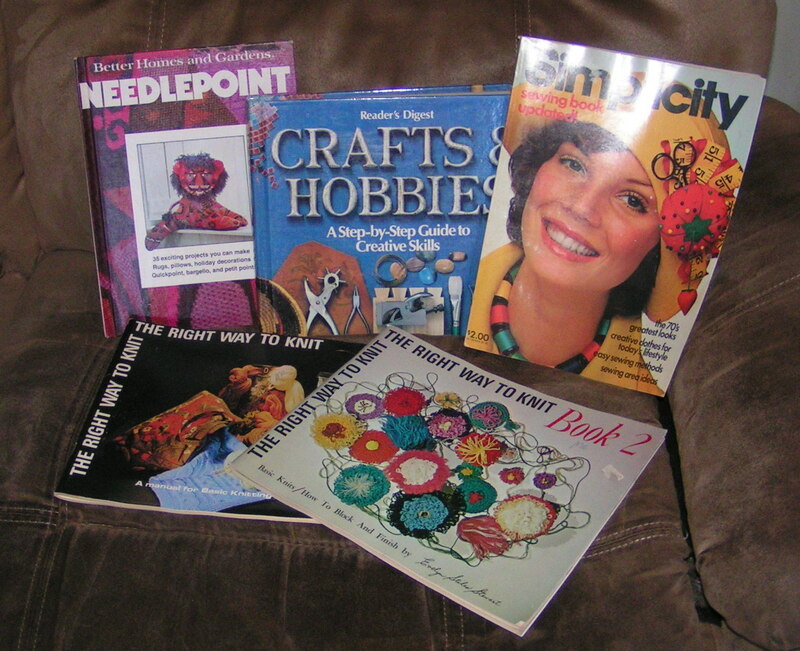 I just adore 1970s and 80s crafting books. They whisk me straight back to my childhood, plus they're often chalked full of timelessly beautiful projects that are well worth seeing the light of day again.